According to the Farmers Market Coalition, "More than 85% of farmers market vendors traveled fewer than 50 miles to sell at a farmers markets." That's compared to the national average food item which travels 3,000 miles from farm to plate. Ali Berlow: About ten years ago I read Michael Pollan’s book ‘Omnivore’s Dilemma’ like a lot of people and it was like pulling back the curtain about the food that I was buying and feeding my family – revelations about where it was coming from and how it was grown. At that time I did most of my shopping at big box stores and grocery chains. Farmers' markets were more like field trips and not part of my regular routine. Pollan’s book left me feeling informed but overwhelmed…powerless and vulnerable with this new understanding about some of the negative impacts Big Ag has, for example, on the environment - to consider that the average food item was traveling 3,000 miles (and burning fossil fuels) just to arrive on my plate. Where I’d once felt confident cooking for my kids, I then lost a sense of security about the kind food that I was buying. And what was even more disturbing, I found myself at a loss about what if anything I could do to change things. Elspeth Hay: Today Just four corporations control more than 75% of the world’s grain trade. There are similar statistics for meat, dairy, and eggs. Over the past 100 years, the majority of Americans have left rural farming communities for cities, consolidating farming knowledge into fewer and fewer hands. Of course, some consolidation is good—it’s allowed us to use our brain power for other things like becoming artists and doctors and civil rights lawyers and inventors. But four corporations? I think that’s gone too far. Talk about putting all our eggs in one basket…. So, when I graduated from college, I decided to work on reviving our lost cultural knowledge when it comes to growing, raising, preserving, and catching food. I started this show. How do you raise chickens? I asked people. What’s the best way to store potatoes? How do you milk a cow or make yogurt or cure meat? What’s sauerkraut? I’ve been collecting this knowledge for our community ever since. AB: I think that’s part of what this ‘Local Food Movement’ is about, the learning (or re-learning) of how to be more self-sufficient. Most of us are a few generations removed now from how to do these types of things. Feeling secure about your food can mean different things at different times I think. Food recalls for instance, they were a big wake up call for me, not just because of food borne illnesses that can actually kill like E. coli but also in terms of how many links exist along the food chain and points of potential problems that can happen. Shortening that chain, from farm or ocean to plate doesn’t guarantee there won’t be a bacteria or virus that can cause harm, but it sure makes for greater transparency in terms of responsibility and a shorter turnaround time to minimize danger. Most family farmers and fishermen are providing food for themselves first they’re taking care to make sure that food is safe. EH: These long food chains are also contributing to climate change as we use fossil fuels to ship food around the world—and manure management and nitrogen-based fertilizers on big, industrial farms contribute too. Climate change in turn is putting food security at risk. Plants and animals are sensitive to changes in temperature and water stress. For instance, global wheat and corn production dropped 5.5 and 3.8 percent respectively from 1980 to 2008 because of rising global temperatures. And that doesn’t even take into account extreme weather events associated with climate change like floods, droughts, wildfires, and very heavy precipitation. AB: I think a lot about resilience, about how to adapt in order to maintain a steady and safe food supply, but I also think about food security in terms of my values - preserving small harvesting environments. For instance, I value clean water - and keeping the brackish water ponds and surrounding oceans healthy so that shellfish farmers can grow and harvest oysters, mussels and quahogs, and that local fishermen can fish competitively and responsibly in these local waters. And I also value land conservation and development that works together with farmers and fishermen to grow and harvest more food locally like fish and meat and of course, produce and dairy. EH: A lot of research says diversity is key in resilient communities. Embracing various ways of farming and producing a variety of foods - what I think of as diversity - is what helps us anticipate risks, limit accidental impacts, and work together to bounce back quickly. I like tomatoes and cucumbers as much as the next person. But I’m also willing to try sunchokes and kohlrabi, because I think diversifying is important when it comes to responding to climate change and a vastly consolidated agricultural system. For instance, we have a variety of fruit trees in our yard—plums, figs, pears, apples, peaches...you name it. The mulberries and the figs are the only ones not being eaten by gypsy moth caterpillars—they’re not a common fruit, but I’m glad we branched out. AB: I think you can see this diversification reflected in society and it’s always changing. For example, vegetables like taioba and jilo that are common in Brazilian cuisine are now consistently being grown on Martha’s Vineyard as a result of the Brazilian immigrants who live here year round. Crops like these have opened up whole new markets for local farmers. I’m always curious how farmers, fishermen, food producers and us, the eaters, adapt to the environment and the economy but also how we adapt to history, culture, tastes, and how we tell stories about it. Like Elspeth said earlier - collecting local knowledge and then sharing it. For me that’s what my work is all about. This piece first aired in 2017. This is a story about making meatballs and feeding people with something we all probably have a lot of in our backyard -- from an animal that could be grazing outside your window -- in your garden right this minute, and that’s venison. Using solar power and good old fashioned ingenuity, the founders of Martha's Vineyard Sea Salt make their salt and then create blends like Lemon Dill, Local Smoked Oak and Naughty. 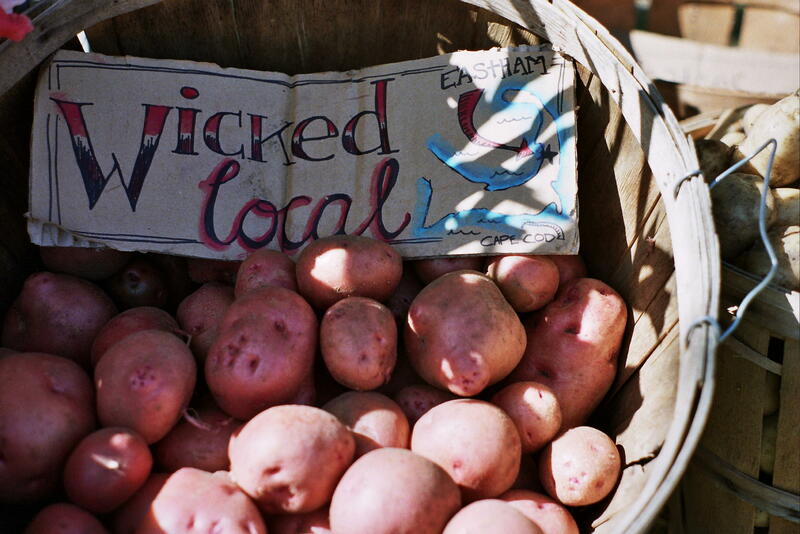 Ali Berlow caught up with them at the West Tisbury Farmers' Market. This story is a rebroadcast. It first aired December 7, 2017.